These biscuits give me LIFE in the morning. 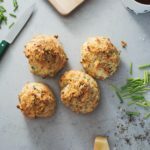 Quick and easy drop black pepper parmesan chive biscuits made with sour cream. I’m loving the new neighborhood Mike and I moved into. Mostly because there’s a little bakery a couple of minutes away that bakes everything fresh, in house. Sometimes we go on early morning walks and the smell is so enticing that we’ll step in, just to look. Of course I always end up getting something. 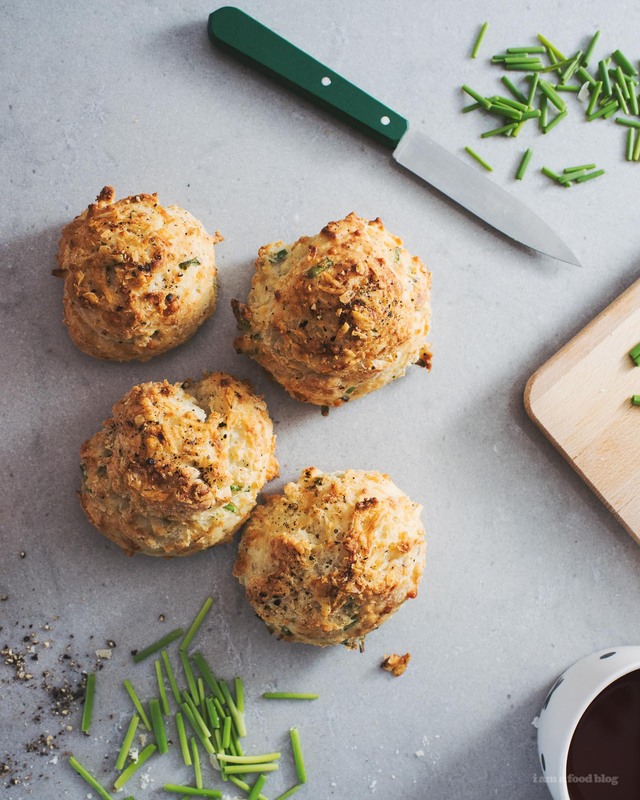 Lately my go to order has been their parmesan and chive scone. It’s crispy on the outside, tender on the inside and super savory. It’s practically heaven in the mornings, but heaven comes with a hefty price tag – almost $4 a scone!?!? So I decided to take matters into my own hands and bake my own. I went with a drop biscuit because drop biscuits are incredibly easy to make: there’s no folding, rolling, or cutting – just a simple scoop and drop situation. But, speaking of simple, I still haven’t figured out the difference between biscuits and scones. 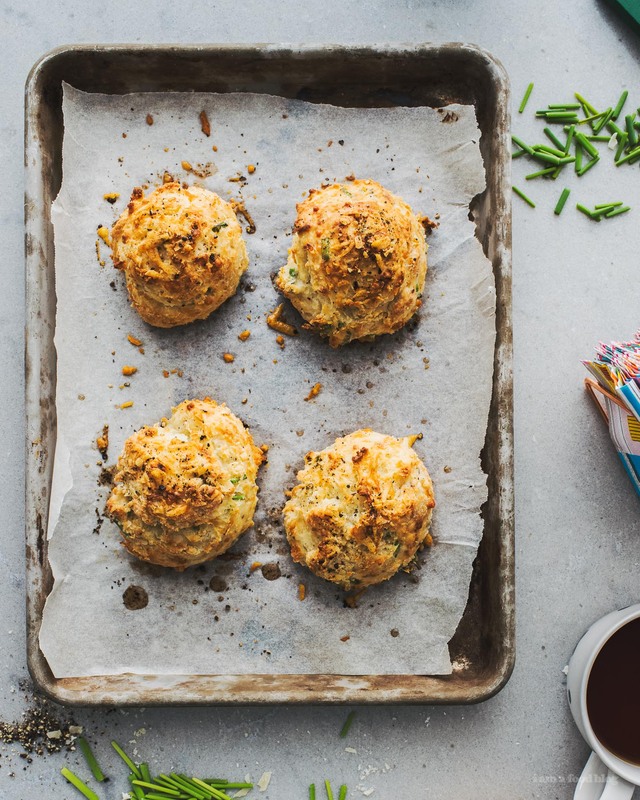 Is this little delicious cheesy, onion-y snack and biscuit or a scone? To be honest, I’m not sure, but I guess it doesn’t matter what I call it, it comes together super quickly and makes your house smell bakery delicious. Make yourself a cup of coffee, mix everything together, bake them up and you’ve got the best breakfast, without even leaving the house. 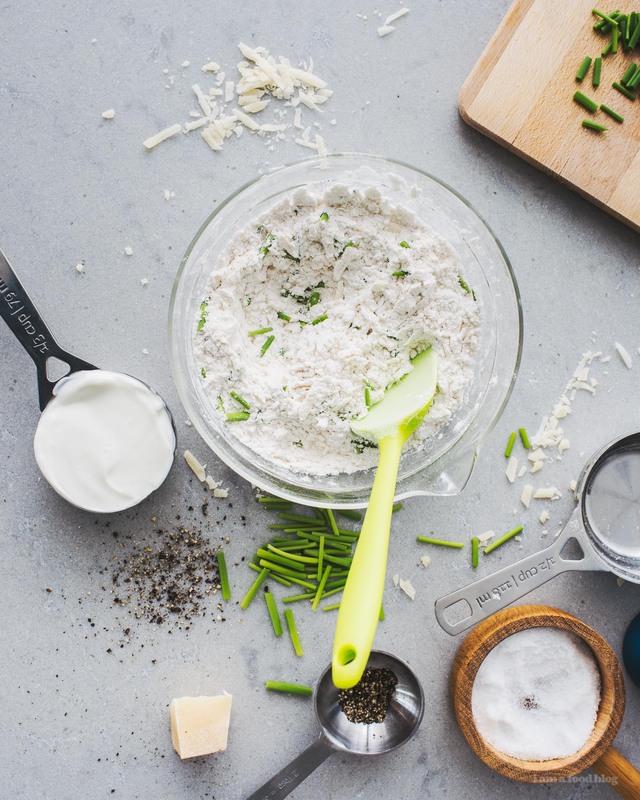 In a bowl, whisk together the flour, parmesan, baking powder, salt, baking soda, pepper, and chives. Stir in the sour cream until the mixture resembles coarse grains. Add the chilled milk and fold until it just comes together. Scoop the batter by the 1/4 cup (I use a ice cream scoop) onto parchment paper lined sheets, 1 inch apart. Bake for 15 minutes, remove and brush with melted butter. Bake for another 5-7 minutes or until golden brown. Love a savory baked breakfast option! What is up with biscuit vs. scone — I will second you on that one! These look amazing though, thanks for sharing! Lovely recipe! What we call a biscuit here in the US, whether sweet or savory, is called a scone in Great Britain. Pronounced to rhyme with “gone”. Why America felt the need to call biscuits scones is purely pretentious. Also in Britain, biscuits are what we call cookies. I love your recipe. I agree with you that baked goods are (yikes!) very expensive. Making them myself and having them handy in the freezer is my way of saving lots of dollars. Oooh these make me think of Terra Breads, where I used to work ^__^. 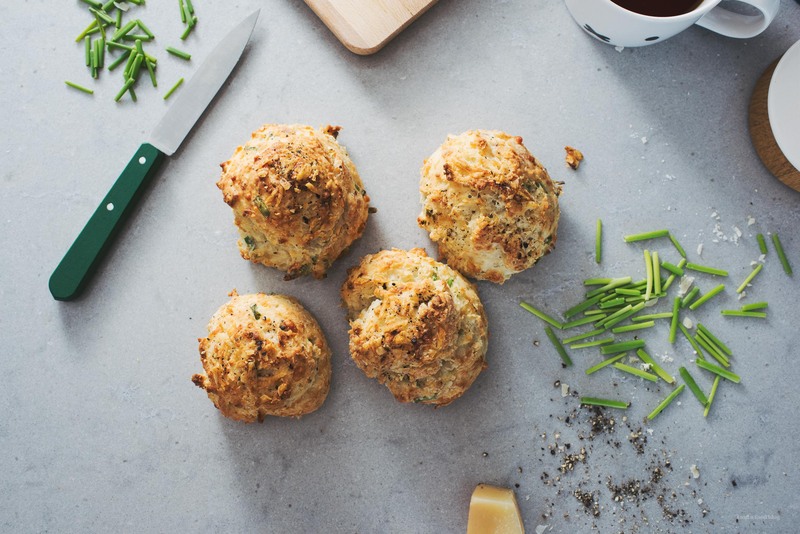 They’ve got the best goodies, including parmesan chive scones!